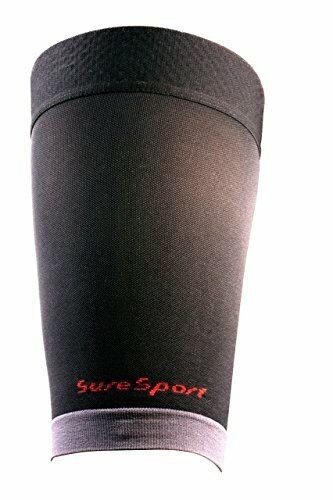 The SureSport Q-Grip Quad Compression Sleeve utilizes industry leading graduated compression technology. Compression increases blood circulation, stamina, performance and energy Whether you're walking, running, cycling, hiking or on your feet all day, the Q-Grip Sleeve will help your endurance, performance and recovery. Features Improves blood circulation Aids in recovery Stabilizes and supports Quadricep and Hamstring Reduce muscle trauma Anatomical fit Breathable and moisture wicking Fits Left and Right Increases performance and recovery Sizing Guide: Measure around the middle of the thigh with leg extended Small/Medium 17" - 21" Large 21" - 25" X-Large 25" - 28"
If you have any questions about this product by SureSport, contact us by completing and submitting the form below. If you are looking for a specif part number, please include it with your message.